I have really been getting into the mood for French food lately thanks to the amazing blog I discovered not too long ago called the Manger. Makes you dream of a life in the French country side with kids, dog and oh wow that amazing food! 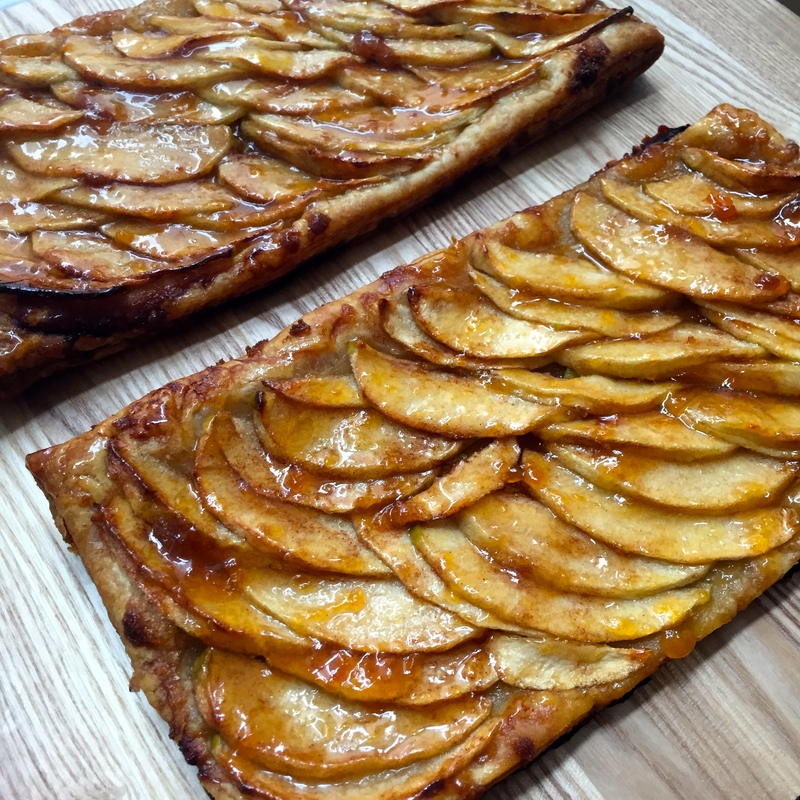 This apple tart is a pretty painless way to conjure up some of the French food no matter how far you are from France! I looked at a few different recipes and came up with this version of my own. 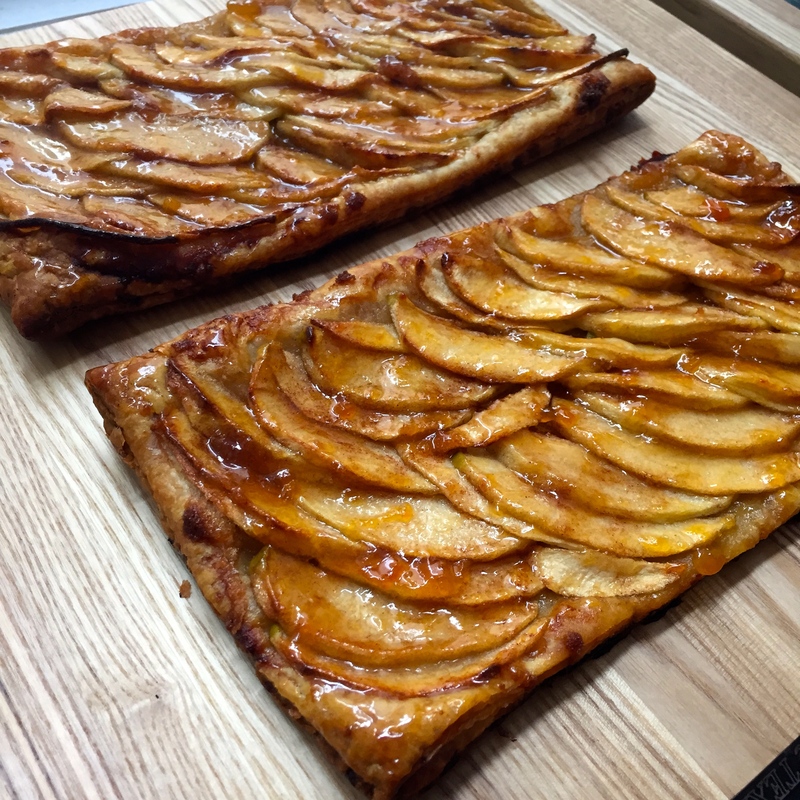 Its a pretty quick but extremely tasty treat made with puff pastry. It is quick in terms of the time it takes to put together but does need 40 minutes to bake to golden perfection. I had some granny smith apples at home which I really could not bear to look at any more and had to use up. It was so good that I am going to have to try it with pears and plums too. Apart from having this with some tea or coffee during the day, I intend to eat it as dessert with some good vanilla bean ice cream. 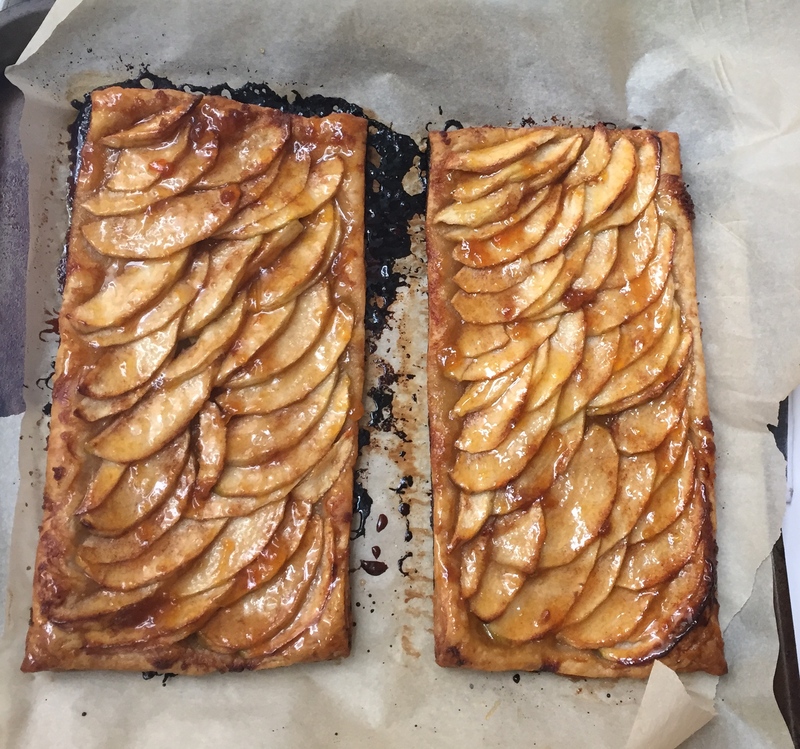 This super simple recipe makes me see why the French are so fond of whipping up tarts, I always thought it was too time-consuming and complicated but so glad I took a closer look and think this is the best way to bring more tarts into my life! I feel like I am now also going to have to try some savory tarts with things like tomato and goat cheese and caramelized onion, I feel like I have discovered a whole new world of drool worthy easy food to make! Aah! The joys of discovering the wonders of puff pastry! Cut the sheet of puff pastry in half and place the two pieces of pastry next to each other on top of parchment paper lined baking tray. Do not skip the paper, or you will have a burnt sticky mess to clean later. Keep the tray in the fridge to chill the pastry. Peel and slice the granny smith apples about 2-3 mm thick. 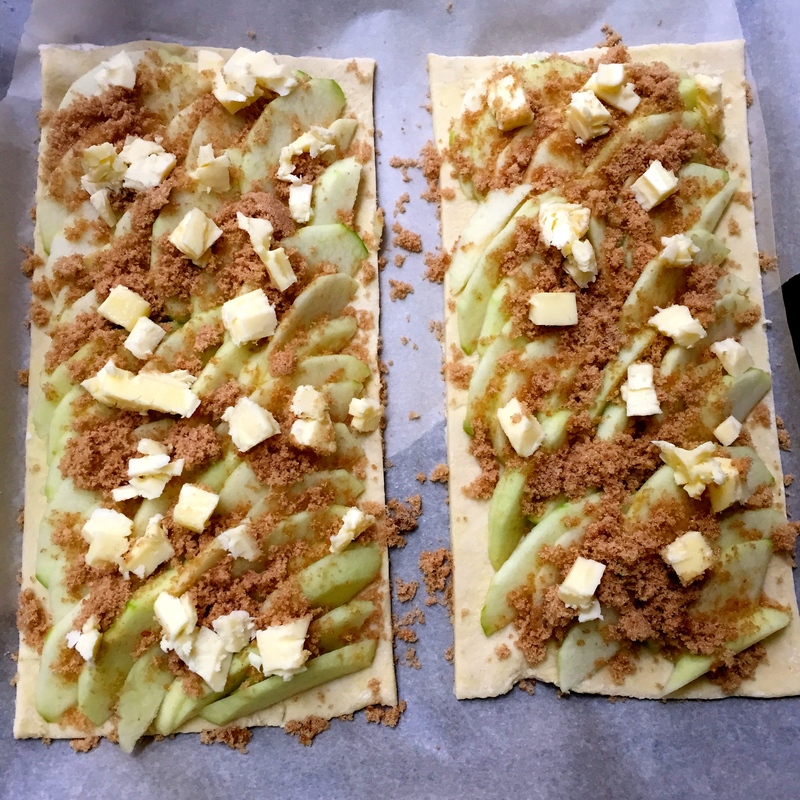 Arrange the apple slices on top of the pastry as shown in the picture, leave an edge all around which is uncovered by apples. Now mix the sugar and cinnamon and sprinkle over the top of the apples. Dot the apples with the cubes of butter. Now pop the tray into your preheated oven for 40 minutes. 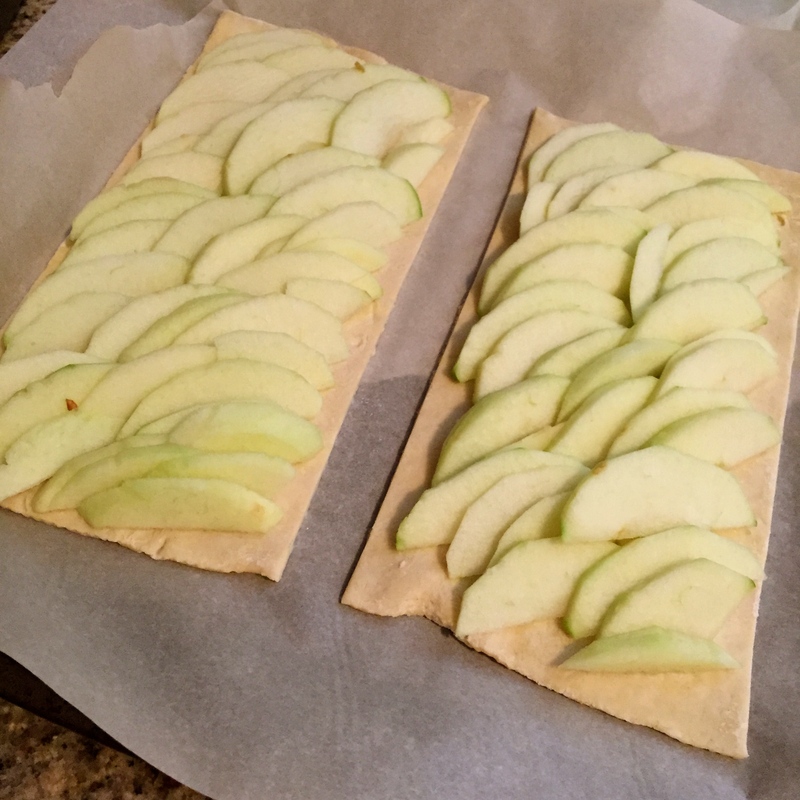 Keep watching over the tarts in the last 10-15 minutes, and be sure they don’t burn or get too dark. Once the tarts are done take them out to cool on the baking tray. In a small saucepan heat the apricot jam with the rum and mix. Heat till the jam mixture goes bubbly and take off the heat. Now brush this jam and rum glaze over the tarts with a pastry brush. Enjoy!